A resolution giving final approval for the county to become a charter member of the Washtenaw Health Initiative (WHI) was on the April 4 agenda. The effort aims to expand health care coverage for the county’s low-income residents. The membership includes a $10,000 annual fee in both 2012 and 2013, which would be funded through the county’s office of community and economic development. The board has been briefed on the initiative, most recently at a Feb. 16, 2012 working session. The plan is intended to help local health care providers handle an influx of an estimated 50,000 newly insured patients when federal health care reforms take effect in 2014. The goal is to develop a plan to provide better health care for the county’s low-income residents, the uninsured and people on Medicaid – prior to changes that will be mandated by the federal Patient Protection and Affordable Care Act. The WHI is a collaboration co-chaired by former county administrator Bob Guenzel and retired University of Michigan treasurer Norman Herbert. The effort is jointly sponsored by the UM Health System and Saint Joseph Mercy Health System, and facilitated by Marianne Udow-Phillips, director of the Center for Healthcare Research & Transformation – a joint venture of UM and Blue Cross Blue Shield of Michigan. Other partners involved in the project include the Washtenaw Health Plan, the Ann Arbor/Ypsilanti Regional Chamber of Commerce, Arbor Hospice, Catholic Social Services, Dawn Farm, Hope Clinic, Huron Valley Ambulance, Integrated Health Associates, Packard Health, Planned Parenthood of Mid and South Michigan, United Way of Washtenaw County, and the Women’s Center of Southeastern Michigan. A full list of partners is on the WHI’s website. Organizers say they hope this initiative will become a model for other communities nationwide that are facing similar issues. 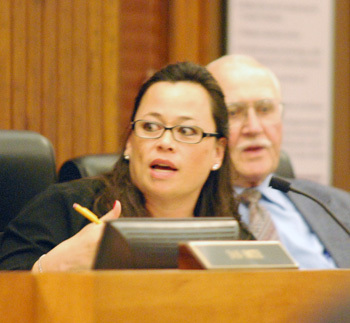 Alicia Ping had dissented on an initial vote taken at the board’s March 21 meeting, saying she preferred funds to go directly to services, not for administrative purposes. She again raised concerns before the final vote. Ping asked if other members would also be paying $10,000. County administrator Verna McDaniel replied that some of the other members are paying, and that she’d get that information for commissioners. Yousef Rabhi reported that the two hospitals – UM and St. Joe’s – are each putting in $30,000 annually. Barbara Bergman said the WHI is working hard to prepare for the impact of the Affordable Care Act, assuming its provisions are upheld by the U.S. Supreme Court. There will be a major influx of new patients who are eligible for Medicaid, she noted. Wes Prater asked what the funding will be used for. There seemed some uncertainty at this point. Representatives from WHI – including former county administrator Bob Guenzel and Ellen Rabinowitz, director of the Washtenaw Health Plan – had attended the March 21 meeting, as most board discussion on agenda items occurs at that time. But no one was on hand to field questions on April 4. Conan Smith ventured that the WHI is conducting research, and that’s likely where the money will be initially spent. Prater then asked if the WHI had already been formed as a nonprofit. Bergman said it’s not set up as a charitable organization – it’s a collaborative. Leah Gunn then called the question, a procedural move to end discussion. Peter Simms, deputy county clerk, began the roll call vote on the resolution by asking: “Commissioner Bergman, how do you feel about that?” The unusually informal query drew laughs from commissioners, with Bergman indicating that she felt supportive. Outcome: On a 9-1 vote, the board gave final approval to become a charter WHI member, with dissent from Alicia Ping. Rob Turner was absent.